It's here: The 2017 UEFL Draft Prospectus is a historical review of umpires eligible for selection via the annual draft. This year's prospectus features updated information from the 2016 season. Click here to draft your umpires for the 2017 UEFL season. Prior to drafting—or if upon review of the following information, you'd like to revise your selections—feel free to consult the following Draft Prospectus, which includes information collected from the UEFL Portal's Historical Data page and workbook. 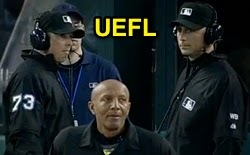 Additional information concerning each umpire on the roster, and the season's crews may be found on the UEFL Umpire Roster and Profiles page. Ejections: 8 (Dale Scott & Todd Tichenor), 7 (Pat Hoberg), 6 (Mike Everitt & Joe West). Replay Points: 9 (Ted Barrett & Quinn Wolcott), 8 (Tom Hallion & Alan Porter), 7 (DJ Reyburn). Total Pts: 29 (Pat Hoberg), 24 (Will Little), 23 (Porter & West), 21 (Sam Holbrook & Adam Hamari). Crew Chief Pts: 15 (Everitt), 14 (Jeff Kellogg & Mike Winters), 13 (Gorman, Vanover & West). Ejections: 8 (West & Holbrook), 7 (John Hirschbeck), 6 (Greg Gibson & Dan Bellino). Crew Chief Pts: 19 (Hirschbeck), 17 (T Welke), 16 (Brian Gorman), 14 (Gary Cederstrom & Hallion). Ejections: 7 (Bellino, Vic Carapazza, Jeff Nelson), 6 (Bill Miller, Mark Ripperger, Timmons, Toby Basner). Total Pts: 36 (Carapazza), 30 (Bellino), 26 (T Barrett, Nelson), 25 (Little, Chris Guccione). Most Ejections Since 2005: 67 (Joe West), 60 (Marty Foster), 57 (Davidson), 52 (Tim Timmons). A name in italics indicates that specific umpire has retired or is otherwise not eligible for selection.